On Saturday 1st October 2011, Australian Air League Squadrons from around Australia will converge on the Sports Super Centre at Runaway Bay, located on Queensland’s Gold Coast to take part on the League’s biennial Review. In the lead up to the Review we take a visit to the Gold Coast Squadron of the Australian Air League to learn more about them. The Gold Coast Squadron reformed in August 2010 and meet every Friday at Pacific Pines Community Centre on Santa Isobel Boulevard, Pacific Pines. Under the command of First Officer Walter Savell and his Officers and Committee the Squadron has now grown to 23 cadets and has begun to make its presence felt. With enthusiastic Officers and Cadets the Squadron has progressed well through the education syllabus, completed drill proficiency badges and also appointed acting NCOs to the Sections. The Squadron has also taken part in a Group Review camp, undertaken model aircraft building and visited the Surf Life Saving Rescue Helicopter hangar. They have also secured the opportunity to operate a “Science of Aviation” display at the upcoming TechGC Gold Coast Science Fair at Varsity Lake on 20-21 August and this should be a great opportunity for the Squadron. 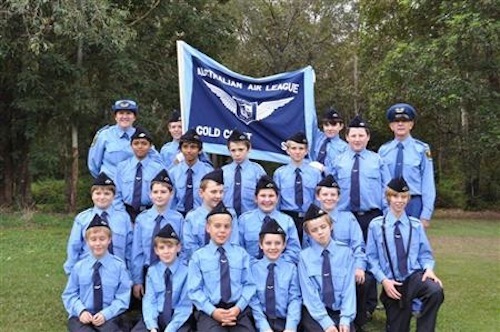 They have also now set up their own website that can be found at http://goldcoast.airleague.com.au and it contains all the latest news and coming events for the Squadron, along with a gallery of photos from Squadron events and the Squadron newsletter. If you are interested in learning more about what they do at the Gold Coast, check it out now!